This Herald Times Reporter article paints a vivid picture of Saxon Homestead Farm for readers interested in learning more about our operation. 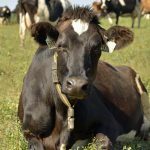 It describes our rotational grazing system and why we have implemented it, discusses seasonal calving and what this means for our farm, and explains why we feel our pasture-based milk is so special. Read the article to discover just how “passionate about pasture” we are at Saxon Homestead Farm!